Some people are good at greeting dogs. And some are … not. It’s not a skill we’re born with (think how long it takes to teach children how to greet people politely! ), so we have to teach those who approach us how to greet our dog - or, indeed, whether they may greet her at all! If your dog is like Greta Garbo, who famously said, “I want to be left alone,” then no greeting is required. This is where you’ll have to use your dog training skills to prevent a quick lunge from the visitor, now wailing “But dogs like me!” as they jump back alarmed from a snap. You may have dogs who lurve people and want to jump all over them. 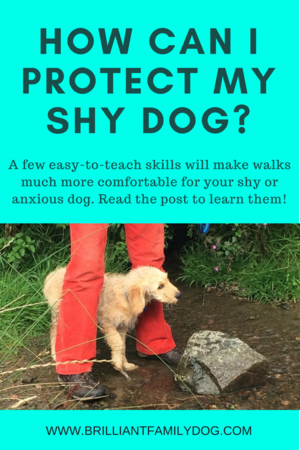 Yapping NO at your dog, flapping your hands and yanking the lead is not going to cut it. You need to teach your ebullient dog how to greet strangers - and for this you need the stranger’s co-operation! So how can you get the people you meet to comply? This means that if your visitor does what you ask, they earn the reward of greeting your dog. If they do inappropriate things (in your dog’s eyes) then you ignore their efforts as you focus on directing them to what you do want, and manage the situation so they can’t interfere with your dog. Or use the tried and tested policeman STOP hand signal. This is immensely effective at stopping people in their tracks, giving you time to arrange your dog where you want her, and allowing you to compose a suitable sentence to keep the person at a comfortable distance. You don't have to make excuses for your dog. Just think of a quick way of getting the person to do what you want. Practice this at home with a friend, so you feel brave enough to do it! If a meeting is appropriate, give clear instructions on how to greet your dog. You’ll train your dog how to do his part, using friends to help you. This means he’ll know this “game” when you want to use it in the wild. Your clear instructions should be brief and simple. For instance, “just hold your hand down by your side so he can sniff it”. This tends to stop people leaning over your dog and grabbing or patting, ruffling or thumping. It also stops your dog leaping up to nose-dot them as they can inspect their hand instead. By the time your dog has sniffed the hand to gain all the information he needs about the person, he’s already back with you for his treat. Job done. Unless you know for a fact that the person wanting to chat to you and your dog will listen to you, follow your instructions, and understand what you’re doing - don’t let them near enough to cause trouble. All this work you’ve put in to understanding how your dog’s mind works and how to get the best from her? It’s just the same with people! You can take a quick overview of the situation, remember my mantra above, make rapid decisions about whether a greeting should or should not happen, and take control of the meeting. This way you won’t be caught out by those who think they know more about your dog than you do, and avoid the embarrassment of muddy pawmarks on the person’s clothes … or worse. Remember if your dog thinks she has to defend herself against this invasive person, she’ll be more alarmed about the next person you pass, and may even consider a pre-emptive strike (leap out and snap) to keep them away.